How do you like your Sorbet? This card uses the Sorbet Double-sided papers from Paper Temptress, which had me intrigued as soon as I saw it on the site and had me wanting to create a card where you definitely saw BOTH of those fabulous colors! I really like the colors pairings, they’re just so fresh and modern, but my favorite color combo is this Cappuccino/Blue Ice, they are the perfect shades of chocolate and turquoise! (and I had no problem finding coordinating inks and embellishments already in my stash to match, which is a big plus!) There are other really juicy colors for spring, too, : melon, kiwi, etc, YUM, you'll see more of these here, I promise! This was made from only one piece of paper, I just love rich, vibrant color on each side! I Cuttlebugged the card front, and since it is essentially like TWO pieces of paper glued to each other, you get this deep, deep embossing. Then I made a scalloped window to let some of that beautiful blue peep through as well as bending down the flap for another a little teaser of what’s to come! When you open it, you card is fully lined with this gorgeous color! (greeting and paper flowers are from Bold Flowers in the Floral Frenzy Kit) If you’ve ever tried to line a card completely, you know it’s difficult to get the score just right, and for them to fold together properly, the bulk just doesn’t really allow it, and you have to trim one to make it smaller, but with this, no problem! I give these Double-sided Sorbet papers two thumbs up! TIP: to make some really beautiful coordinating "buttons", stick an adhesive page pebble to a wide piece of ribbon. Carefully trim around it with your scissors and add a circle mat just a touch larger in metallic or contrasting colored CS behind it. Doesn't that ribbed texture and sheen of the ribbon coming through the pebble look cool?! I was so excited how they turned out! Did you know you have an entire week to play the challenges on StampTV, wow, that's a lot of chances to win free stamps! So no excuses not to enter (except "I had so long I forgot!" LOL!) My lucky friend Charmaine Ikach won the very first Stamp TV challenge, congrats Charmaine! We've already had technique challenges, a color challenge, sketch challenge and yesterdays' potluck... ;) Don't think you'll be able to do them this week? We've got another round of 'em next week for you! If you haven't yet joined StampTV, please do so today, it is SO exciting to see the community grow (already over 2000 members! ), and I want to be sure you're all on "my friends" list, then we can stay in touch even more easily :) (just click on my pic and add me as a friend!) While you're there, have fun customizing your own page by adding a picture, start building your own gallery with your favorite projects, change the settings to make the page look they you want it, and add your friends to create your own little network. For our very first Stamp TV "Potluck Friday" challenge*, I chose the theme “Split Screen”, and here is my sample. By splitting up one large image (or several images that make up a focal point) into different pieces, you can extend your design and bring focus to different areas of the image or spotlight a special one! 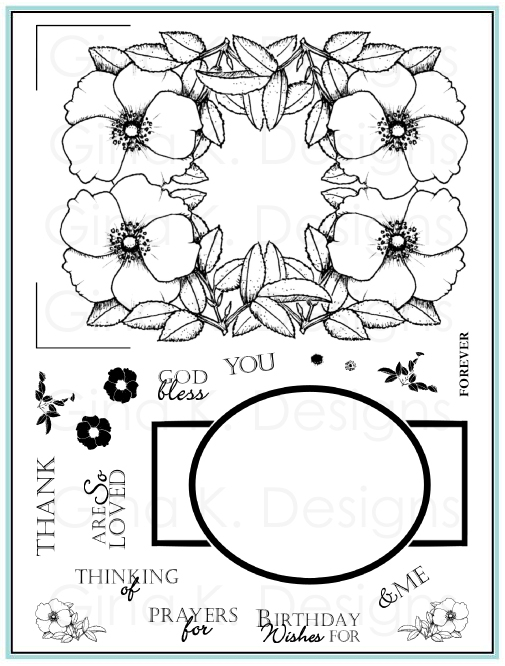 Flowers images (from the new Floral Frenzy Kit, or others you may have in your collection) are perfect for this, so many beautiful parts to a flower: the bloom, the stem, the leaves. This card uses a silhouette from “Elegant Flowers” from the "Floral Frenzy" kit (papers and ribbon are included in the kit, too!) is divided into equal one inch sections (I was feeling very “Zen” whe I made it! ), but separating your image into uneven large and small sections can also make for a very stylish design, too! The parts can be aligned or skewed, you decide! (You do not have to use my layout, or even flowers for that matter LOL!) Can’t wait to see what you make! Please upload your creation to Stamp TV with the keyword STVPF1. You do not need to use Gina K stamps to participate, although we'd love it if you did! We just want you to play along and have fun! You have until next Friday, March 6th, at 8am CST, to upload your sample. 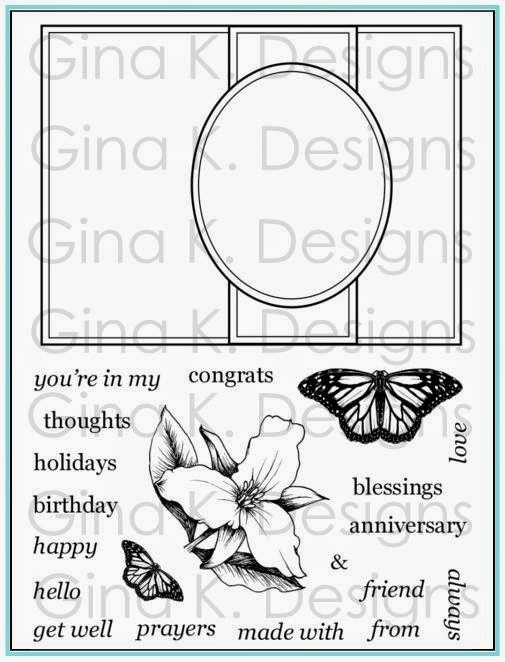 One winner will be drawn at random to win a Gina K stamp set valued at $19.95 or less, winner's choice! Here is the full card I peeked at the Wednesday night's Paper Temptress party! This sample uses three papers, all from Paper Temptress, the Black and White you see are the new “Lustre” papers. I recommend having your stripes going in the same direction if you’re going to layer them like this, isn’t that black on white and matching striped texture and sheen on both stunning and so coordinated-looking? This White Lustre paper gives your images such a 3D look, and even though the paper has the finest striped texture, you still get such perfect detail in your stamp image, even those tiniest of lines as you can see (I really don’t know how it works, but it does! ) The mat behind the butterfly is Gold Ore, it is perfectly smooth and so shiny, I can only think to compare to the gold foil stars your receive for a job well-done LOL! Use these in large sections or even just the tiniest borders like this to really accentuate earthy tones; your reds, orange and yellows (like I’ve used on the butterfly) will look like they’re on fire when paired with this to this paper! This was a simple and quick card to make, but the papers really say WOW! These papers cost a little more than some I work with, but they need little or no ornamentation which saves me time and money in the end, so I’m loving these! Butterfly image is from Gina K's "Take Flight", stamped in Memento Tuxedo Black and colored with Copics. 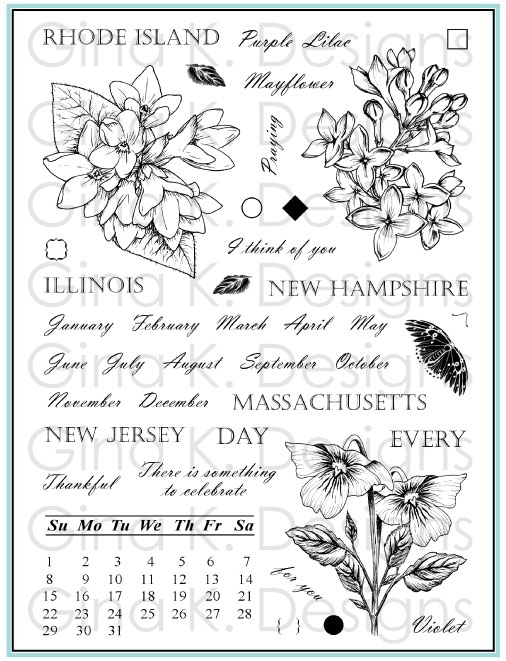 I think Patricia has almost everything added to the store now or will soon (be sure to check the newly added cardstocks here, she'll keep updating through tomorrow, takes a while to list 50 new papers!) , You can buy as little as one sheet of each (or as much as you need! ), so you might want to create a custom sampler of your favorite finishes! The word of the day is "KISSING"
Did you see it??? Dare I say, it's even prettier than the first Neapolitan pack?! I was SO inspired by these new "Neapolitan 2" prints that coordinate with the "Floral Frenzy" Kit and papers, I got busy printing out 3 of my faves to create a little coaster tabletop book for a friend who's having a baby girl. Each side of the coaster page will be for a month in the first year where she can easily add a little pic of the baby (which is REALLY important for the new mom, "EASY"!!). I printed out 3 sheets from the Neapolitan 2 pack, one pattern per each 8 1/2 x 11 piece, the coasters are 4 inches square so you can cut 4- 4" square pieces, plus have some extra for trim , embellishments, whatevah! I 'staggered" my prints so the front and back of each would be a different pattern. Punch each corner with the corner rounder, line them all up back to front with which page you want each the patterns to fall, and mark where you want your two holes to go on the top sheet. You can punch through all 14 pieces (if you've just used regular printers paper like I did, with the big hole in the Cropodile punch. TIP: Then place your first sheet upside down in the inset of your Scor-Pal if you have one, this is such a great way for getting two things the same size lined up when adhering! Put your adhesive all over the coaster and stick down onto the paper (see pic, I am about to put the coaster on the paer!). Now cover the top side of the coaster with adhesive and press you next piece of DP right side up, onto the coaster. Use the holes already punched in your paper a a guide to punch your holes through the coaster. Isn't this bling 'bet from MFT perfect with these papers?? I didn't even *bling* them up, LOVE the pink showing through, a perfect match with the little dots on the button flowers pattern!! !If you scroll back up to the top you can see I used a paper flower to dot the "i" on the cover(with a page pebble over some of the stamped dotted paper for the flower center, polka dot stamp is in the Floral Frenzy kit, too! ), and on the last page I actually stamped my "e" right on to one of the larger flowers! (all stamping was done in Rich Cocoa Memento) Have fun with this alpha, it's so sassy and classy, lots of options!! So what's up with the "kissing", you might be wondering? The "technique of the week" is KISSING, a fave of mine LOL! ;) I don't have a sample of it TODAY, but you can bet Gina does, in glorious, moving technicolor, so go check out the kissing video now on StampTV and take the kissing challenge! :) You could win free stamps! Dn't forget to get your free download of this gorgeous digital paper pack, click here! Paer Temptress party tonight 8 PM CST!! More deets to come, hope you can come, there's free paper up for grabs! But I did include PINK today (from the kit!) LOL! I found you can carefully ink up just one row of dots from the background stamps in Bold Flowers with a marker, (I chose the middle line of dots on the stamp so the block wouldn't rock), and line that up with the middle line on your grid line block andalign that line with one of the stamped dotted rows on the pink, then stamp! I like how this detail draws your eye back in forth in a zig-zag Z down the card. The sentiments are punched out with the SU! 3/4" and 1/" circle punches and popped up on dimesnionals (uh oh, just realized I used dimensionals,(not in the kit) but you have these right?? It's really hard for me to stay away from those, dimension just makes it "pop"!) , the little dotted scraps are stamped in Rich Cocoa Memento ink with the polka dot stamp from this set, and scallops on the ends to match my flowers were created with the threading water punch. Foliage is inked up with Old Olive. All papers, base and layering, are from the "Floral Frenzy" Kit. This clean and simple creation makes for a very happy thank you in under 10 minutes! Have a great day, thank you for visiting! Remember, Paper Temptress Party tomorrow night! and don't forget to play the StampTV challenges, there's free stamps to be had! A recipe for success: 1 ink, 2 stamps, 3 papers= 1 fast and FABULOUS card! Today's sample uses two beautiful new papers from Paper Temptress, Elegant Laid (Avalanche White) and Silver Lustre, a kind of prismatic holographic paper that allows the ink to "slip" below the surface to create an almost 3-D effect. Clcik the pic for a closeup to see the silver shimmer! The silver stripes are so beautiful by themselves, I stamped Gina K's "Tropical Flowers" image on top in Memento Tuxedo Black ink (the silver paper turns the black ink a dark gray) and mounted it onto SU! Basic Gray CS. The Elegant Laid paper, which I stamped my greeting onto (These are words put together from my "Say it with Flowers" set tp form the one sentiment, stamped off Memento Black once to get a dark grey ink to match the flowers) has a very fine striped texture as well. I made sure the lines were both going vertically in my design, gorgeous with the vertical of the flowers. The matted panels are all popped up on dimensionals. This a is a 4 1/4" square card. 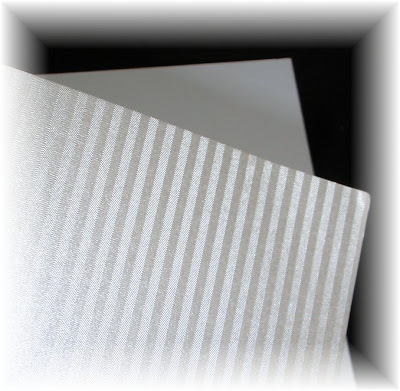 Another terrific feature of this Lustre paper, the back is smooth white, so this makes a fantastic card base: outside you have a beautiful silver finish, the inside is white for writing your message! Above I have it pulled over so you can see the front and the back. Love this simple elegance, this was a VERY simple card, but I think it's just stunning! Special papers like these with a beautiful image make it easy...you don't even need embellishments or ribbon, the whole card front looks like a gorgeous piece of striped satin! Also, there is a new challenge with a prize (free stamp set!) EVERY day over at StampTV this week! Yesterday's challenge was thumping, watch the video and upload your card to the site for a chance to win,( it's a random drawing) you have until Wednesday for that one! Challenges will be hosted each day by a different member of the Gina K Designs design team (one by yours truly on Friday!) This will be going on EVERY week so get in the habit of playing! :) Let's go see the challenge for today! Here is a card I created for the My Favorite Things Masking Challenge. Going through my MFT, MFTPresents, and BCDZYNS stamps, I didn't right away see any images that were begging me to put them together, and then shazam! Little Isabelle from Stephanie Fizer and one of Annie Lapointe's tubs, made for each other, don't you think? Her little bare shoulders are perfect for tubby time, and their styles really go together to look like it could very well be one image. To put them together, start by inking up only the tub, no ink on the flowers, and stamp. Now cover the tub with a post and stamp Isabelle so her head and shoulder are peeking out. I colored everything with Copics (the focal point started as a white piece of Gina K Pure Luxury CS, I filled in the background with a pale aqua Copic), and added a few rhinestones bubbles above. The tub, puddle and fish toy below are all covered with Crystal Lacquer. The dark red background DP is from the Basic Grey Bittersweet pack which inspired the fabulous colors for the tub. Ribbon is SU! 5/8" rose and base is Paper Temptress Berrylicious. I stamped out "thank" and "you" three times each in Rich Cocoa Memento ink, and punched them out with my 3/4 inch circle, I love the big and small rim that leaves around the circle stamps. Then I layered them on circles punched from the kit's pink and chocolate layering papers. 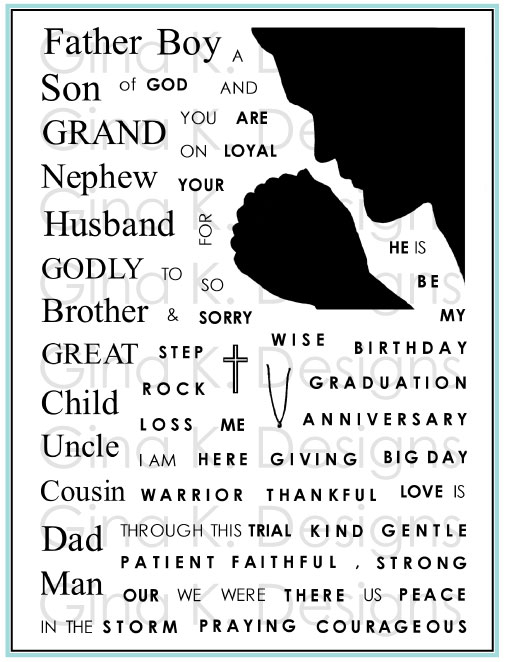 On the front, the layered "thank" is attached on the left side, "you" is attached on the right. "You" is popped up on a dimensional and overlaps the front edge so you can tuck that flap in to fold it together, see pic.
" Thank you, thank you, thank you, isn't that cute?! You can never go wrong with pink and chocolate, sigh!! I mean, really, as if you're not feeling self-conscious enough already!!! Did you see StampTV is already up to almost 1000 members in less than 24 hours?? Please go join if you haven't already, I have a *feeling* there may be a drawing for another prize out of the members :) the place is already rockin! Don't forget to go order your FREE digital paper download from Gina, too! Have you ever looked at Gina's picture or read her blog and thought: "I wonder what she sounds like? what she's like in person? what it would be like to stamp with her?" Well, now you can find out! After year and a half, Gina's labor of love, "Stamp TV" is finally here: a free resource available to all stampers, featuring broadcast quality video tutorials by Gina herself (along with a lot of other fun STUFF!) 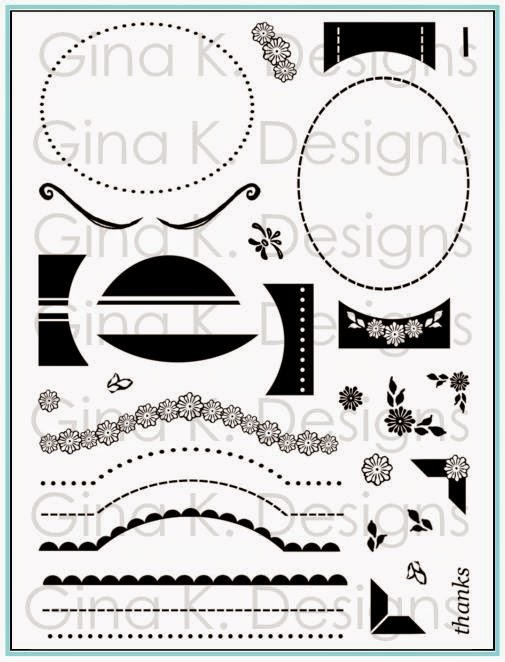 using, of course, Gina K designs Products! Not only will she show you how to create beautiful projects, but she'll be releasing limited edition stamp kits several times a year filled with the Gina K materials you need to complete them right along with her on the video! 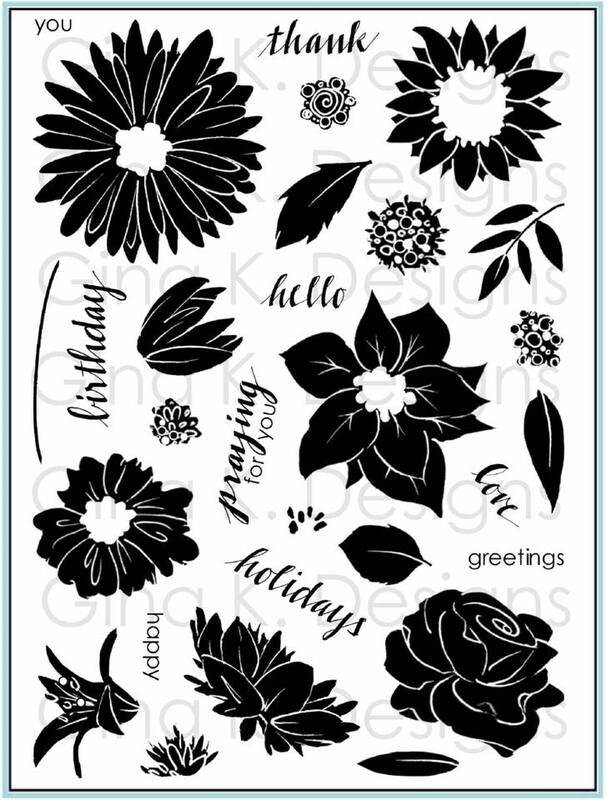 My sample today uses both stamps sets included in her first Showtime Stamps Kit "Floral Frenzy" : "Bold Flowers" a big and chunky modern set, and "Elegant Flowers", classic sentiments, line art and silhouette florals. You are correct if you guessed these irises are from "Elegant Flowers", but where's the "big and chunky?" you're probably thinking?? You'll be thrilled to find "Bold Flowers" includes two 2 inch square background stamps, one being this antique crackle pattern! Is that gorgeous or what? I stamped out the irises in Memento Black on Gina K Pure Luxury layering weight Ivory CS (yes, you read that right, IVORY!!!) and colored them with Copics (blue-purple irises are my fave!) Then I stamped over them (didn't mask) with the crackle stamp in Antique Linen Distress ink. I stamped it 4 times to cover the whole mat, the uneven lines make it a cinch to "line up", no need for a stamp positioner to get even coverage, and I love that!) Everything else you see here is included in the kit: brads, this beautiful rust patterned paper (you get an assortment of several patterned sheets in the kit plus the digital file to print as much as you want when you run out! ), this thick BLACK CS, and gingham ribbon. You won't believe when you see the rest of the kits contents (because there's more!) any more than you will believe the price, it's such an incredible value, but I'll let Gina tell you about that on her blog! Please go check and see all that Stamp TV has to offer, and check out the kit, (there's even a video that shows you the contents closeup! )available only at Gina K Designs!! Today I played this week's sketch challenge on Splitcoast : the half circles at the top were something I would have never come up with on my own! :) The images you see here were inked up with markers using a technique called "thumping". And guess what? The materials used to make this project came from a special new product being launched tomorrow at Gina K. Designs! Hip hip hurray!! The pub is here! Just had to share : my first published card is now on the newsstands! CardMaker March 2009, (pg. 86, my new lucky number, hee hee!!) 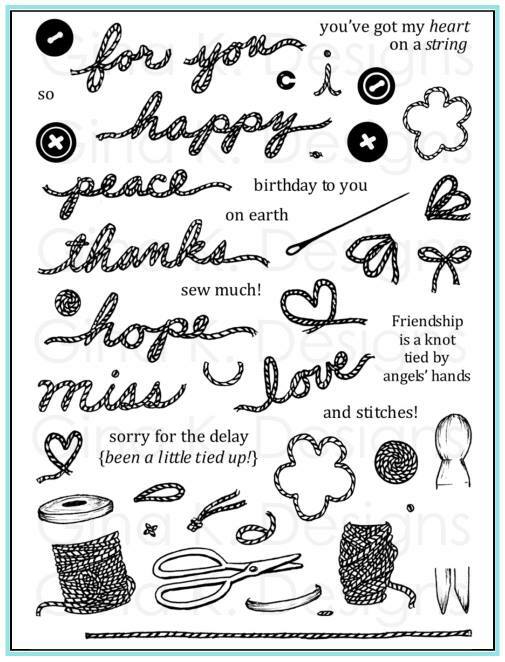 I love that my first published card just so happens to use my very first stamp set "Just So Hippy" (as well as "Hip Hop Accessories"), how appropriate! (That was not intentional, I submitted several others that first time, so it could have been any of one of my first several sets!) I actually spotted the magazine at Barnes & Noble a few weeks ago, but was waiting to get my issue in the mail so I could share a pic with you! (A few of you actually already saw it, and emailed me congrats, thanks ladies!) ;) Obviously I knew what the card was going to look like, but it was such a fun surprise to see how beautifully they photographed and staged it, I heart that daisy!! What a thrill! Oh, I'd also love to know: any of you subscribe to Cardmaker? Any other pubs you like/had success with/ recommend I try submitting to? Thanks for reading and sharing my good news, please share if you have some of your own! Have a blessed day! Just had to share a pic of little William making some hand-dipped creations for Valentine's Day this past weekend (as he counts them out: "e-LEV-en, TWEEEELVE,..."!) Boy, was I disappointed to find my camera needed recharging when I wanted to get a pic of him post-chocolate covered LOL! ("The best things in life are covered in chocolate! "*) I could have waited, but it was really a situation where he needed to get washed up ASAP!) We still had a bunch of chocolate left over after all the strawberries were done, so we ended up going through the fridge and pantry to see what else we could dip! bananas, graham crackers, Rice Krispie treats, ...YUM!! The chocolate is great for this project, "Ambrosia" brand, you can quickly melt the blocks in the microwave and it hardens up soon after dipping. He did a nice job, we will definitely pull this trick out more often than Valentine's Day to get them to eat their fruit!! Today's card involved snipping apart the little dog-cat-mouse trail from "Warm and Fuzzy" to allow for a slightly different arrangement: I drew in a little string around the dog's leg with a black pen to pull the little mouse behind tempting the little cat, isn't that cute? (the cat's going along with it, but his expression, looking out at us, makes him look like he suspects something's up!) I pulled out my Kraft paper for this one to keep the focus on the scene rather than a bunch of other colors or patterns. The swirly lines and hearts image were perfect with the little string I drew, so I stamped that in Versamark on my Kraft Base and followed the line with some black dots (tied that in around my mat and with the dotted ribbon, too) these endless trails take you round and round the card! Hearts were accented the Inkssentials white pen. I love Kraft, black and white together. 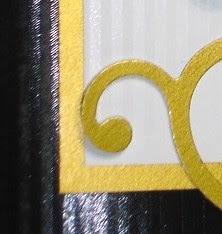 Here is a closeup of the images (stamped in Memento Black on Gina K Pure Luxury 80 lb white CS). I colored them with Copics, the shadows were done with C-3 Cool Gray. 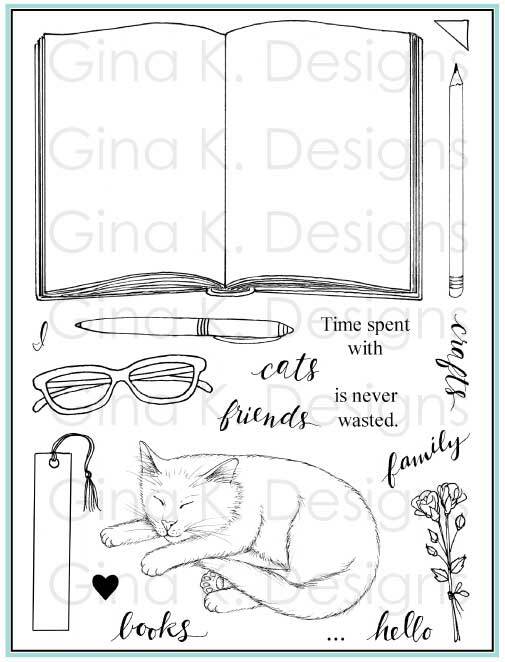 I love how the little stripey tabby turned out, have fun adding spots and stripes to your open line art stamp images for a new look! Now, please follow me over to Gina's for something new and truly exciting which will be available from Gina K Designs beginning on Friday! On Thursday, Gina and the rest of our Design Team will have previews to share. You won't want to miss it, so head on over to read Gina's hint for today!" Paper Temptress Group at PCP! 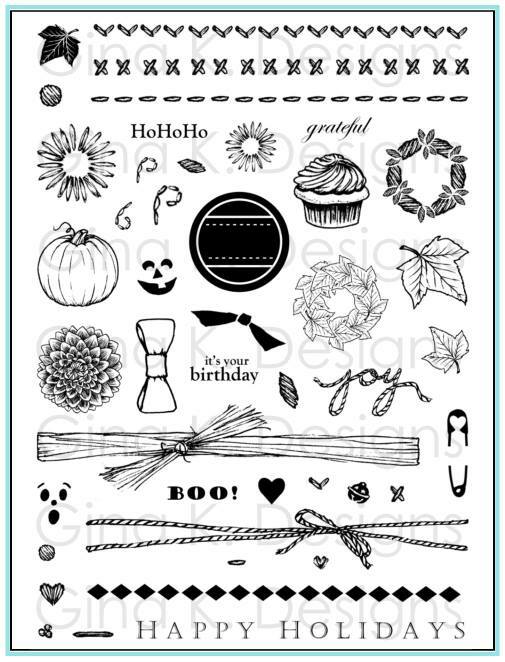 Her is a sneaky peek of one of the newest paper offerings from Paper Temptress! I made a "to die for" card with it but am not yet allowed to share, can't even link it because it's not in the store yet, but...coming soon!!! Up for a prize today? If you would like to know about paper challenges, see the featured "Paper of the Day", find out about paper specials before anyone else, ask questions about all things paper, and have a chance at weekly prizes, please go join Patricia's new Paper Temptress's Paper Lovers group on PaperCraft Planet! It's free to join and just takes a second (just click on join group under admin options in this link, Patricia will be drawing one lucky person from all group members who are signed up by Friday to win a large and fabulous assortment of her finest papers, including some not yet released, so don't delay! Winner announced this Friday! 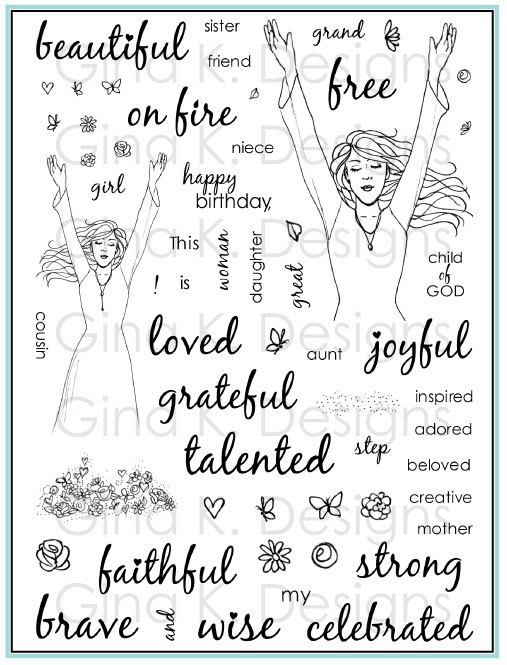 BTW, A couple of my favorite stampers are on the Paper Temptress Design Team with me, among some other very talented ladies you may or or may not know yet, but you'll see when you get there! :) Don't wait! I really wanted to get this completed to share with you BEFORE Valentine's Day as an idea, but,I actually didn't make it for a valentine, it's for a friend's birthday. You can find these adorable chocolate-covered fortune cookies any time of year at Target (and I've seen them at specialty candy shops, too) a pink container filled with 6 cookies is $4.99. I was happy to see the Friendship Fortune pack was pink with a dark chocolate covering (her fave! ), they also have a Love Fortune pack, in a red container with milk chocolate. The cute container and decadence of chocolate-coated fortunes makes this a great value I think! The little stamped fortune made with my "Have a Cookie" greetings I curled up and down with my fingers and attached in two spots with dimensionals. I love how it's just "floating" there slightly bent, looks like you just pulled out a real fortune and left it sitting out! Card base is Cameo Coral, almost a perfect match with this box! Inside I stamped the sentiment from "The Best Things in Life" in Rich Cocoa and covered the "chocolate" in Crystal Lacquer as well. So I had a lot more turorials than I even thought, see my sidebar at right! Many I'd forgotten to label as such when I really went through...I have some broken down into "punch", "coloring", etc, but I think I might revise it even further to have separate categories for these instead of all under tutorials. I'll get there...! One thing I will take away is the "sightings" lists for my stamp sets. I just don't have time to keep them properly maintained and even when I spend a LOT of time searching for cards, I still always miss some great ones! 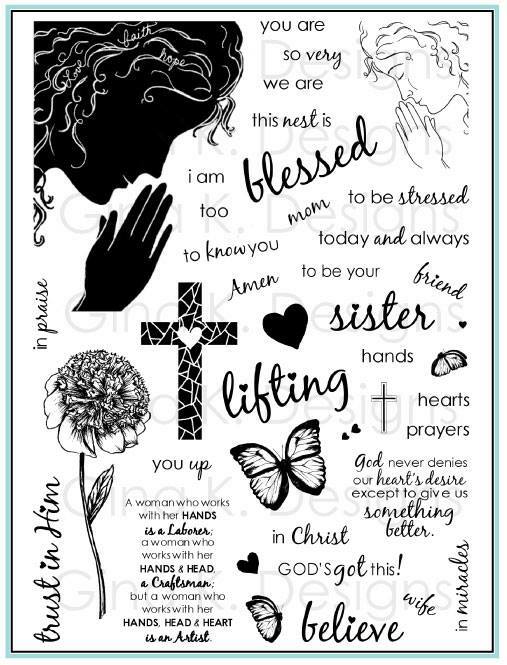 Instead I ask you to let me know if you made a card you want me to see that you made with my stamps, I would love to share these with everyone here from time to time! Just a leave a comment with a link or send me an email! This is a card I created for the My Favorite Things Guest Designer contest this month, I got an ambassadorship for the month! :) I wanted to make a girl chatting with ther manicurist at the spa, it's a view master card that allows you to use several of the greetings from the "And Then I Said" set from BCDZYNs. The image is colored with Copics. I added a few images from Rupa's "Perfectly Polished" set, the polish bottles are popped up with glue dots and covered with Crystal Lacquer. The shadows for the bottles are done with a dark Grey Copic. Her shirt is pieced from Basic Grey Bittersweet papers, which I also used for the trendy "poured concrete" counter. ;) Her face is layered to give it a paper tole effect and self adhesive rhinestones bling the card and her hand up a couple notches! The picture helps show how the card was assembled before I added the girl and other decorative elements that completed the scene. I used the SU! word window punch for the window, the sentiments are on a circle underneath, the brad allows it o turn. For more on View Master card construction, see this post. I had several people email me or leave comments saying they don't think they could draw that towel...well, as with all the other "new do's" I've given her, it IS still her hair! Let me show you, you can do this. I colored in the bangs and left the rest of the hair white. Then I made a curved line to connect the outside to the next section in. 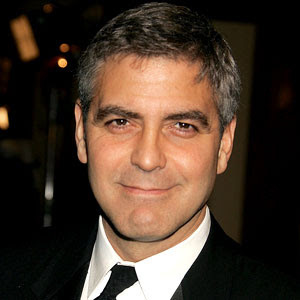 I repeat this as I work toward her chin on both sides. Here you have the complete wrap with just a bit of light gray on the underside of each section for a shadow. Finish coloring and cut out! ta da! I'll be back in another post to show you some flesh coloring tips, this is one of the only "lady" stamps I have, so I've gotten lots of practice with it! :) I have another card coming up soon that is similar in concept, really fun, can anyone guess? Here is my original pic, opened up in Microsoft Digital Image Pro 7. I take my pics with Sony digital camera. Jonathan was almost 5 in the pic, he'd just found a huge butterfly on our front porch. Then I clicked on "Effects" and then "Black and White". I love black and white photos, you really focus on the shapes and "the moment"! Now I'm going to use a tool under "Effects" called the "Colorize Brush", this allows you to tint certain areas of your photo in the color of your choice. Unlike the Paint Brush, this adds transparent color over your image so you still see detail rather than just a big stroke of opaque yellow. Select your color and drag your mouse across the areas you want to tint. Although I don't use a lot of yellow in my projects normally, it's such a happy color and I wanted to keep the integrity of the butterflies true color (both happened to be this buttery yellow) I will tie this color into all three photos, very appropriate for these golden moments! Now to crop it! I selected the same size as my frame opening and dragged it around until I had both of the most important elements inside, his little profile and the butterfly. After printing them out and trimming (I use Kodak photo paper and an hp printer), I wanted to create some vellum mats that would kick this frame up a notch to look like frosted glass panes and highlight parts of my images. (You know those expensive ones you see at Restoration hardware of Pottery Barn?) Here you can see I chose two Nestabilites dies, a classic rectangle and a square, doesn't that look cool having the two geometric shapes offset like that? (I placed the full peice of vellum on top, then placed my dies over that to figure out exactly where to cut) I love this spotlight it creates on his face, it's before he lost that beautiful "little boy roundness" to his features and those beautiful little curls (his hair is pretty straight now, sigh!) It's okay the openings cover up parts of his head and the butterfly, just get the important stuff in there! :) I stamped "free..." from my "The Best Things in Life" set in Memento Tuxedo Black ink. 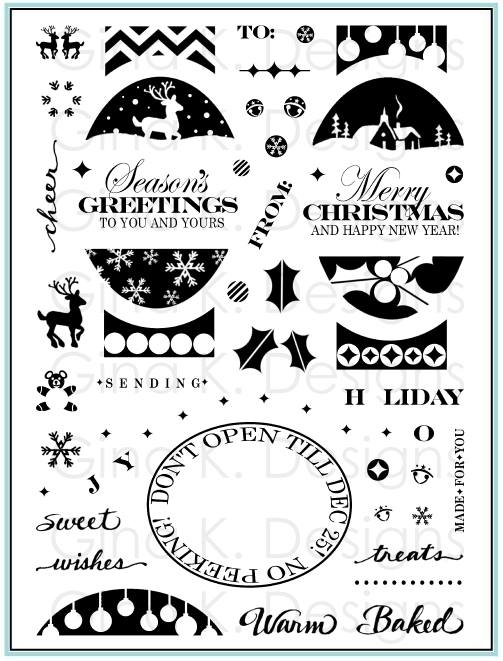 (Heat set or blot to make sure the ink's dry before moving so you don't smear it when stamping on vellum. and one of my sweet William, taken just a few months ago. This one I cut with my largest rectangle die. I hope you enjoyed this photo tutorial. I was so pleased with how artsy, expensive-looking, and personal this turned out! Hope it inspires you to try dressing up your favorite photos with a little creative (strategic!) editing, stamping and papers before hanging them up! Projects like these would also make great gifts for friend and relatives, just ask them to email you their favorite photos! You can do this!! Want to WIN a Digi Kit? ?